At its best, this affecting biopic of the cosmos-rattling astrophysicist Stephen Hawking (Eddie Redmayne) smartly avoids schmaltz. Hawking has often seen the dark humour in the disease that began robbing him of his muscular functions as early as his student years. ‘The Theory of Everything’ runs with that irony: this is a Hawking profile in which you’ll see the wheelchair-using, speech-impaired scientist happily rolling around his living room dressed up like a Dalek. More substantially, it’s also a movie that delivers science in an approachable, Brian Cox-like way. An early scene has a thoughtful professor introducing the Cambridge student to a lab where all the action happens; it’s a lovely moment of quiet inspiration. The film is filled with snazzy visual metaphors: a swirling cup of coffee becomes a symbol for dark and light matter. 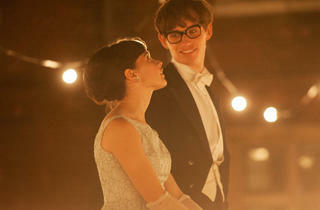 A formal dance, where Stephen twirls with his future wife, Jane (Felicity Jones), twinkles with party lights and a hint of the universe falling into place. The film is Jane and Stephen’s story (the script is largely based on the second of Jane Hawking’s two memoirs), and even though it smooths out some of their domestic unease and eventual divorce, there’s still a painful strain below the surface, from playful sparring over religion to the tougher realities of ambitions put on ice. Both performers are extraordinary, and while Redmayne has more physical mannerisms to master, Jones burns hotter as a strong woman who can’t forget her own needs. I thought this was a really wonderful and engaging film; I was fascinated by the story of Hawking and the romance between Jane and Stephen was quite beautiful. I also was rather surprised by the third person in this relationship, of whom I had no idea and it was fascinating to read a bio afterwards that confirmed the truth in this - as I actually thought it couldn't possibly be true! The acting, is of course is, impeccable and the emotions conveyed in the story line were so powerful. My only criticism is that it had the gloss of 'Hollywood' stamped all over it, despite being a British film and I think it would have been good to see some of the struggles they faced conveyed with a bit more realism. You didn't really see enough of the struggle that the couple went through the day to day battles they faced as Stephen's illness progressed. What a lovely film, really enjoyed it! A beautiful, moving film - well worth the awards and all the hype. If you haven't see it yet, go! Moving account of the relationship between Stephen Hawking and his wife Jane. 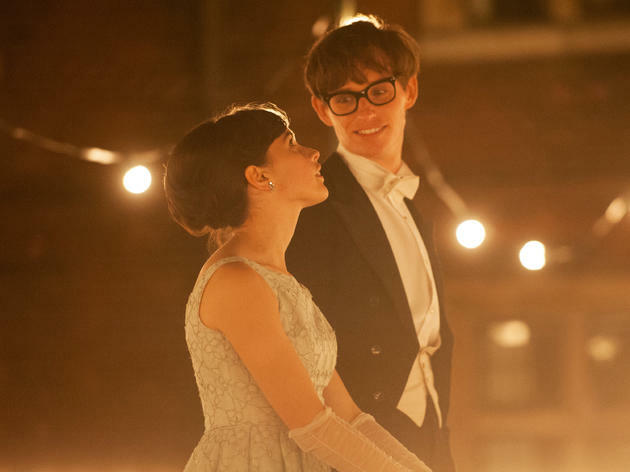 Felicity Jones is superb as Jane but Eddie Redmayne`s portrayal of Professor Hawking is absolutely outstanding and will live long in the memory. Such a beautiful film. Loved eddie and felicity! Good british humour in there as well to keep it flowing well. I wasn't ready for what I saw and thoroughly recommend this film for the remarkable performance by ER as The Professor. Such a clever film in what it showed and didn't show and some insights for us all into MND and its impacts. See this film, an Oscar performance by Eddie that knocks The Imitation Game out of the ring into geostationary orbit. I rarely give 5 stars, but this film deserves it imho. A magnificent achievement. The film is beautiful and painful to watch, it will at the same time break and warm up your heart. Everyone is roughly familiar with the story of Doctor Hawking, a brilliant mind locked in a body that cannot move, but not everyone is familiar with the story of his first wife Jane. Have you ever babysat three kids for an afternoon? It's a challenge! Now imagine bringing three up as well as being the primary caregiver to your disabled husband who is progressively getting worse and does not want help; who is the one of the brightest minds in the world but cannot hug you. The film is radiating a glow, just like Doctor Hawking discovered black holes radiate a small amount (Hawking radiation) and just as a black hole, the marriage very slowly dissipates. But that does not diminish in the least how you perceive and admire both characters on their own rights. Eddie Radmayne and Felicity Jones are breathtaking in the film, fantastic performances, a huge challenge for Eddie, as he portrays the failing body perfectly while his eyes shine with the desire to live. It's a film about a quiet fight against all odds and against all odds I hope it will win all the awards.